Jack Randle Gannon grew up (mostly) in the Missouri Ozarks, and says quite bluntly,"I am proud of my hillbilly heritage." Deafened at age 8 by spinal meningitis, he attended several schools, including California School for the Deaf, but got most of his education at Missouri School for the Deaf, Fulton, where he had several outstanding teachers and mentors. In an upcoming memoir, he tells how badly he wanted a BB rifle, saving up every bit of change he had, and after his father refused, his mother suggested he write a letter to his Dad explaining why he needed the rifle. He took her advice, wrote the letter, and, as a result, his Dad okayed the rifle. It was perhaps his first experience with the power of words. After graduating from MSD, Jack enrolled at Gallaudet College, where he met Rosalyn Faye Lee of Winston-Salem, North Carolina, his classmate. They soon began dating, and their courtship lasted through college. Jack acquired useful experience editing The Buff and Blue (the campus newspaper) and the 1959 Tower Clock (yearbook). He majored in Education, but dreamed of running his own newspaper. Shortly after Rosalyn and Jack graduated in 1959, they married. Both taught at Nebraska School for the Deaf, where Jack taught graphic arts, coached football, and edited the school's "Little Paper Family" periodical, The Nebraska Journal. When his football squad completed an undefeated season in 1967, the first in NSD's history, he was honored by Omaha's WOW-TV as "Coach of the Year." The Gannons returned to Gallaudet College in 1968, where Jack became the first full-time Executive Secretary of the Gallaudet College Alumni Association, and helped establish and headed the first Alumni Office there. He was Director of Alumni Relations, and succeeded Merv Garretson as Special Assistant to the President for Advocacy, assisting Dr. I King Jordan with his many responsibilities. Rosalyn taught sign language in the Pre-College Program, and coached, too. Jack was active in several Deaf organizations. One of his many honors is the honorary Doctor of Letters degree bestowed by Gallaudet University in 1988. Best known as a writer and historian, Dr. Gannon edited The Gallaudet Almanac (1974), a compendium of facts, snippets, and lore. Rosalyn has collaborated on all of his projects. His best-known work, originally published in 1981 and recently reissued with a new preface, is Deaf Heritage: A Narrative History of Deaf America, the most comprehensive history of its kind written to date. It is a monumental, hefty book, full of historical notes, biographical snippets, sidelights, timelines, rosters, records, with a rich array of illustrations (photos, cartoons, line art, etc.) chosen and laid out by Rosalyn. It was to have been published in time for the NAD's Centennial Convention in 1980, but ran a year late. It was written, compiled, and produced by Deaf people . . . the best imaginable rebuttal to the old canard that deaf people could not write their own history. The Week the World Heard Gallaudet (1989) is an attractive photo-chronicle of a revolutionary event. Gannon curated the historic Smithsonian exhibition, History Through Deaf Eyes, which traveled to 12 cities between 2001 and 2006. (A documentary, Through Deaf Eyes, was aired on PBS in 2007, and is available as a DVD.) With Douglas C. Baynton and Jean Lindquist Bergey, he co-authored the companion book, Through Deaf Eyes: A Photographic History of an American Community (2007). World Federation of the Deaf: a History was published in 2011, a complicated project that took 17 years to complete, despite the rise of the Internet. Compared to Deaf Heritage, layoutwas relatively easy . . . but dealing with small, disorganized Deaf organizations across the world, proved to be incredibly time-consuming. The Gannons' two children, Christine and Jeff, are doing well. Both hearing, both good signers, and both have their own families. Jeff runs a "green" home-restoration/construction business in North Carolina; Christine directs Health and Wellness at Gallaudet University. 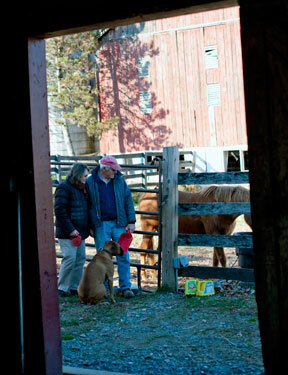 The Gannons, and Christine and family, live at the "Tempted to Be Content" Farm near Frederick, Maryland. They bought it as a rundown old place and have been restoring a nd improving it for 26 years. The unusual name was taken from the final address given by Edward Miner Gallaudet, founder and first president of Gallaudet University, when he retired in 1910. Jack says, "I am thrilled that today's generation of deaf students have a book like Deaf Heritage which was written for them by a Deaf author just like them and where they can learn who they are and about the Deaf community's many contributions to America and the world."